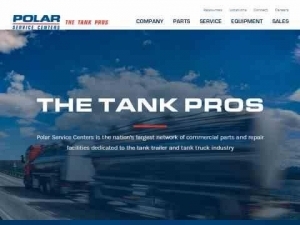 The Polar Service Centers parts departments represent virtually every product category needed to keep your tanks rolling. We also offer complete truck rigging packages for loading and unloading product. The Polar Service Centers service departments are code shops capable of performing any job from a simple fender replacement to a major rollover repair. Tank Transport Product-Service Directory » Tank Container Depots » Svcs-2 1/2 and 5 Year ABS Testing"